Before I start finding some deals, I just HAD to post this. It's beyond adorable and I can't wait to make it for my baby girl. 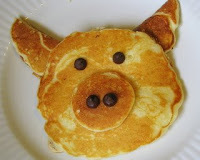 Amy over at The MotherLoad posted how to make Piggy Pancakes yesterday. Puts a smile on your face, eh? OK, now I'm off to find some deals. Be back soon! This is SO CUTE!! I'm going to head over to Amy's site. My kids are going to love these!